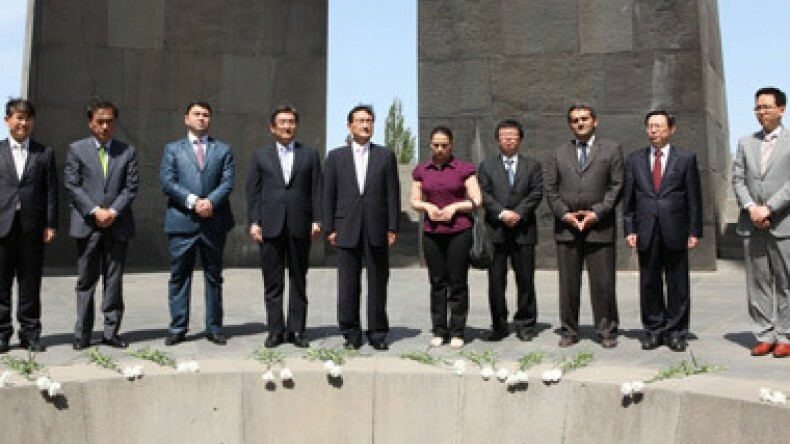 As part of its visit to Armenia, a delegation led by Deputy Chairman of Korean National Assembly Hon Jae Hyon, accompanied by Deputy Speaker of Armenian Parliament Edward Sharmazanov, visited Genocide Memorial in Tsitsernakaberd on May 15, Armenian Parliament’s press office reported. Korean delegates laid flowers at the Armenian Genocide Memorial and observed a minute's silence in memory of the Armenian Genocide victims. The Korean parliamentary delegation also visited Armenian Genocide Museum-Institute. The head of the Korean delegation answered media questions. “Armenia and Korea have a history that goes back many centuries. Both peoples have gone through many difficulties and ordeals. Now both countries move towards development and democracy. Few know about Armenian Genocide in Korea. Currently we make efforts towards presenting complete information on Armenian Genocide. Korean MP Nah Youn Mi has written a book on the Armenian Genocide,” Hon Jae Hyon told reporters.